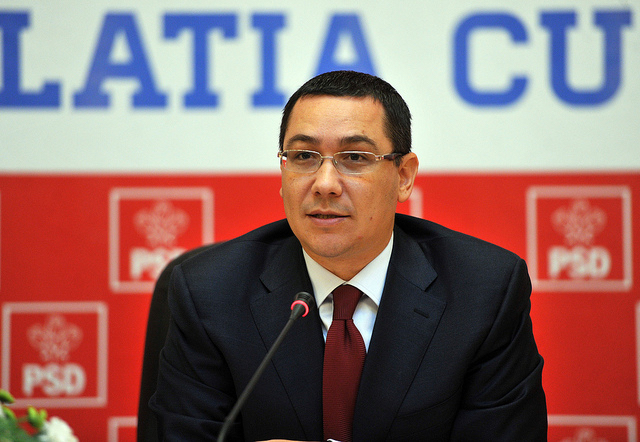 Romanian Prime Minister Victor Ponta resigned today (4 November) following street protesters, as the death toll from a weekend Bucharest nightclub fire climbed. The events coincided with Bucharest hosting a NATO mini-summit. Ponta, the country’s only sitting premier to face a trial for corruption, had already been under pressure to resign from the opposition, and President Klaus Iohannis, who defeated him in last November’s presidential election. Ponta will be succeeded by Mircea Du?a in the capacity of interim Prime Minister. Du?a has served in the Ponta cabinet as interior minister, and more recently, as defence minister. He is also member of parliament from Ponta’s Social Democrat Party (PSD). The junior coalition party UNPR, under Deputy Prime Minister Gabriel Oprea, said in a statement that it was willing to keep supporting the Socialist-led coalition government. Romania will hold parliamentary elections in December 2016 and it is expected that until then, a new cabinet will be formed. The opposition liberal PNL party of Iohannis wants snap elections, whicle PSD is against. The Romanian political system allows for prime ministers to quit and new cabinets to be formed, as long as parliamentary backing is preserved. No snap polls have ever taken place since democracy was instituted after the collapse of Communism in 1989. Ponta stepped down to take responsibility for a nightclub fire on the night of 29 October that had claimed the lives of 32 people by Tuesday (3 November) and set off protests nationwide. “I can carry any political battles, but I can’t fight with the people,” Ponta told reporters. Angry about the way authorities grant permits and inspect public venues, protesters poured into the streets late into Tuesday night, carrying banners saying “Corruption Kills” and chanting “Murderers!” In Bucharest, an estimated 25,000 people marched to the government headquarters, and the interior ministry, earlier in the day. “Victor Ponta is giving up his mandate. Someone needs to assume responsibility for what has happened. This (is a) serious matter and we promise a quick resolution of the situation,” Dragnea told reporters in parliament. Ponta is likely to face his first court hearings later in November, after being indicted for forgery, money laundering, and serving as an accessory to tax evasion during his time as a lawyer. The dramatic political events did not prevent Romania from hosting a NATO mini-summit on Wednesday. Leaders of nine Central and Eastern European and Baltic states met in Bucharest today, and said in a joint statement they were gravely concerned by Russia’s “continuing aggressive posturing” and backed a sustainable NATO military presence in the region. “We will stand firm on the need for Russia to return to respect of international law as well as of its international obligations, responsibilities and commitments as a pre-condition for a NATO-Russia relationship based on trust and confidence,” the leaders said in a joint declaration. Russia’s seizure of Crimea and support for pro-Kremlin rebels in eastern Ukraine last year has alarmed Baltic and eastern European states. Leaders of the NATO alliance have also expressed concern at what they see as Moscow’s growing military presence from the Baltics to Syria, after Russia launched air strikes in support of President Bashar al-Assad five weeks ago. The declaration also said the leaders would join efforts to secure “a robust, credible and sustainable” allied military presence in the region, and would advocate deeper cooperation between NATO and the European Union. It was issued after a meeting in Bucharest of heads of state including Lithuania’s Dalia Grybauskait?, Latvia’s Raimonds Vejonis, Estonia’s Toomas Hendrik Ilves, Slovakia’s Andrej Kiska, Bulgaria’s Rosen Plevneliev and Hungary’s János Áder . The talks were co-chaired by Romania’s President Klaus Iohannis and Poland’s President Andrzej Duda. The President of the Chamber of Deputies of the Parliament of the Czech Republic, Jan Hamá?ek, and Deputy Secretary-General of NATO, Alexander Vershbow, also attended. The US-led alliance’s next summit will take place on 8-9 July 2016 in Warsaw.